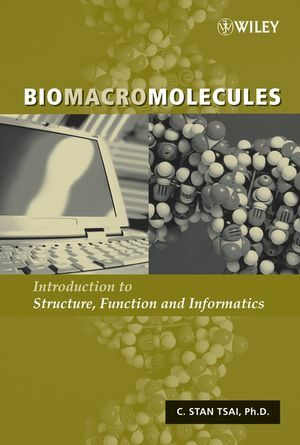 This book provides an integrated treatment of the structure and function of nucleic acids, proteins, and glycans, including thorough coverage of relevant computational biochemistry. The text begins with an introduction to the biomacromolecules, followed by discussion of methods of isolation and purification, physiochemical and biochemical properties, and structural characteristics. The next section of the book deals with sequence analysis, analysis of conformation using spectroscopy, chemical synthesis, and computational approaches. The following chapters discuss biomolecular interactions, enzyme action, gene transmission, signal transduction, and biomacromolecular informatics. The author concludes with presenting the latest findings in genomics, proteomics, glycomics, and biomacromolecular evolution. This text is an invaluable resource for research professionals wishing to move into genomics, proteomics, and glycomics research. It is also useful for students in biochemistry, molecular biology, bioengineering, biotechnology, and bioinformatics. C. STAN TSAI, PhD, served for more than twenty years as a professor of chemistry and biochemistry at Carleton University, Canada. He is the author of An Introduction to Computational Biochemistry, also from Wiley. 1.4 Isomerism: Configuration versus Conformation. CHAPTER 2. MONOMER CONSTITUENTS OF BIOMACROMOLECULES. 2.1 Nucleotides: Constituents of Nucleic Acids. 2.2 á-Amino Acids: Constituents of Proteins. 2.3 Monosaccharides: Constituents of Glycans. CHAPTER 3. PURIFICATION AND CHARACTERIZATION. CHAPTER 4. BIOMACROMOLECULAR STRUCTURE: NUCLEIC ACIDS. 4.2 Sequence Analysis of Nucleic Acids. 4.3 Secondary Structure and Structure Polymorphism of DNA. 4.4 Supercoiling and Tertiary Structure of DNA. 4.5 Classification and Structures of RNA. 4.6 RNA Folds and Structure Motifs. 4.7 Energetics of Nucleic Acid Structure. CHAPTER 5. BIOMACROMOLECULAR STRUCTURE: PROTEINS. 5.1 Architecture of Protein Molecules. 5.2 Primary Structure of Proteins: Chemical and Enzymatic Sequence Analysis. 5.3 Primary Structure of Proteins: Sequence Analysis by Tandem Mass Spectrometry. 5.5 Secondary Structures and Motifs of Proteins. 5.6 Domains and Tertiary Structures of Proteins. 5.7 Classification of Protein Structures. 5.8 Quaternary (Subunit) Structures of Proteins. 5.9 Quinternary Structure Exemplified: Nucleoproteins. CHAPTER 6. BIOMACROMOLECULAR STRUCTURE: POLYSACCHARIDES. 6.1 Propagation of Polysaccharide Chains. 6.2 Sequence Analysis of Polysaccharides: Primary Structure. 6.3 Conformation: Secondary and Tertiary Structures of Polysaccharide Chains. 6.4 Conformation: Description of Some Polysaccharide Structures. 6.5 Glycobiology: Study of Glycoprotein- Associated Glycans. 6.7 Organizational Levels of Biomacromolecular Structures. CHAPTER 7. STUDIES OF BIOMACROMOLECULAR STRUCTURES: SPECTROSCOPIC ANALYSIS OF CONFORMATION. 7.2 Ultraviolet and Visible Absorption Spectroscopy. 7.5 Nuclear Magnetic Resonance Spectroscopy. 7.6 Optical Rotatory Dispersion and Circular Dichroism Spectroscopy. CHAPTER 8. STUDIES OF BIOMACROMOLECULAR STRUCTURES: CHEMICAL SYNTHESIS. 8.2 Synthetic Strategy: Conventional Approach. 8.3 Synthetic Strategy: Solid Phase Approach. 8.4 Practice of Solid Phase Synthesis and Its Application. 8.6 Biochemical Polypeptide Chain Ligation. CHAPTER 9. STUDIES OF BIOMACROMOLECULAR STRUCTURES: COMPUTATION AND MODELING. 9.1 Potential Energy and Molecular Thermodynamics. 9.2 Molecular Modeling: Molecular Mechanical Approach. 9.5 Structure Prediction from Sequence by Statistical Methods. 9.6 Molecular Docking: Prediction of Biomacromolecular Binding. 10.4 Specificity and Diversity of Antibody- Antigen Interactions. 10.5 Complementarity in Nucleic Acid Interactions. 10.6 Molecular Recognition in Carbohydrate- Lectin Interaction. 11.1 Biocatalyst: Definition and Classification. CHAPTER 12. SIGNAL TRANSDUCTION AND BIODEGRADATION. 12.2 Elements of Signal Transduction. 12.3 Effector Enzymes and Signal Transduction. 12.4 Topics on Signal Transduction. 12.6 Hydrolysis versus Phosphorolysis of Glycans. 12.7 Nucleolysis of Nucleic Acids. 12.8 Proteolysis and Protein Degradation. CHAPTER 13. BIOSYNTHESIS AND GENETIC TRANSMISSION. 13.1 Saccharide Biosynthesis and Glycobiology. 13.2 Genetic Information and Transmission. 13.3 DNA Replication and Repair. 13.4 Biosynthesis and Transcription of RNA. 13.5 Translation and Protein Biosynthesis. 15.1 Genome: Features and Organization. 15.2 Genome Informatics: Databases and Web Servers. 15.3 Approaches to Gene Identification. 16.1 Proteome: Features and Properties. 16.2 Proteome Informatics: Sequence Databases and Servers. 16.3 Proteome Informatics: Structure Databases and Servers. 16.4 Proteome Informatics: Proteomic Servers. 16.5 Protein Structure Analysis Using Bioinformatics. 16.6 Investigation of Proteome Expression and Function. 17.2 Glycomic Databases and Servers. 18.1 Variation in Biomacromolecular Sequences. 18.2 Element of Molecular Phylogeny. 18.3 Phylogenetic Analysis of Biosequences. 18.4 Application of Sequence Analyses in Phylogenetic Inference. 18.6 Evolution of Protein Structure and Function.